The following test brochure applies to our Keith Nose Hollow Point bullet. Our bullets are .44 caliber and are designed for use in sabots in either .50 or .54 caliber muzzleloaders. Our bullets are all hand made and swaged from pure lead. Each bullet is guaranteed to be accurate in weight to +/- one grain. All bullets are available in weights from 230 grains to 350 grains. It should be noted that all bullet weights from 230 grains to 350 grains gave the similiar expansion characteristics. Over the 150 yard range of testing, the variance of trajectory from one weight to the other was largely insignificant under normal hunting situations. Bullet weight should be selected primarily for purposes of optimum accuracy. There will always be the perfect bullet weight for each individual rifle, although the entire weight range will give satisfactory accuracy results in rifles having a 1-38" twist or faster. Muzzleloaders do not harvest game the way we would like them to. Many of us have experienced the frustration of spending more time hunting game once we made the shot than we spent hunting to get the shot. Seemingly perfectly hit deer have run off into the woods virtually unaffected. If you too have experienced this, read on as we have a solution to this common problem. A bullet harvests game by transferring the kinetic energy it possesses into the vital area of the body cavity of the intended game. A 300 grain bullet ahead of 100 grains of black powder will generate approximately 1550 ft/lbs of kinetic energy. Elmer Keith, a pioneer of ballistic study and bullet testing, determined that 800 ft/lbs of kinetic energy is sufficient to cleanly harvest White-tailed deer size animals. Using this figure as our bench mark, the modern muzzleloader has enough energy to accomplish this at approximately 150 yards. Why then are these animals not being harvested cleanly? The problem is not one of insufficient kinetic energy, but rather that an insufficient amount of kinetic energy is being expended inside the body cavity. In order for this kinetic energy to translate into the humane harvesting of game, the bullet must dissipate this kinetic energy inside the body cavity. A bullet which passes through the intended game without releasing its energy is totally useless. Ideally the bullet should dissipate all its kinetic energy inside the body cavity. A bullet recovery box was built and filled with material that would simulate the tissue of a game animal. As the material used was only intended to give a relative assessment of the bullets expansion and penetration characteristics, exact simulation of tissue material as a collection medium was not important. Each bullet was then fired into the box from the same gun at the distance of 100 yards using 100 grains of FFg powder. Each bullet was then recovered from the collection medium. The total distance of penetration into the box and size of expansion of each bullet was then recorded. The photograph below outlines the results of this portion of our testing. 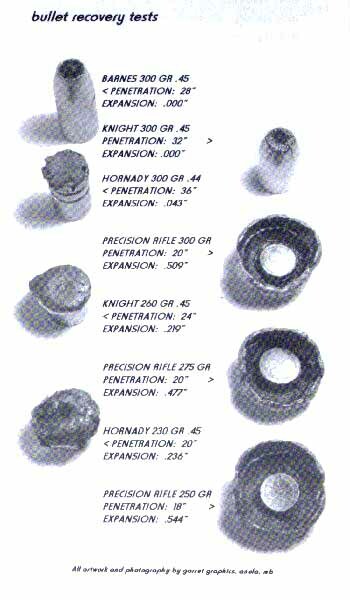 By comparing our bullets to the ones that we knew, from actual field experience, did not perform to our satisfaction, we were able to determine the optimum combination of expansion and penetration. After dozens of combinations of nose designs, core designs, and base designs were tested, we came up with bullets which give immediate expansion, full penetration and total weight retention. The final test to determine that our bullet would perform as expected on the intended game was to test them on the actual game of choice used in the design process; White-tailed deer. This meant testing the final product on the carcass of a white-tailed deer and recovering the bullets for weighing and measuring. All shots were fired from 110 yards. Bullets varied in weight from 250 grains to 300 grains. Powder charged varied from 70 to 100 grains of FFg. The recovered bullets are pictured in the photograph which follows. From top left to bottom right the bullets are numbered One through Five. Bullet One was shot broadside through both front shoulders. Bullet Two was shot broadside through both lungs without contacting any ribs. Bullet Three was shot broadside through both lungs contacting a rib on entrance as well as exit. Bullet Four was shot broadside through both rear hams. Bullet Five was shot quartering away passing through the liver, both lungs and contacting a rib on entrance as well as exit. As seen in the photograph, each bullet expanded to identical proportions. Each bullet retained all the original weight. 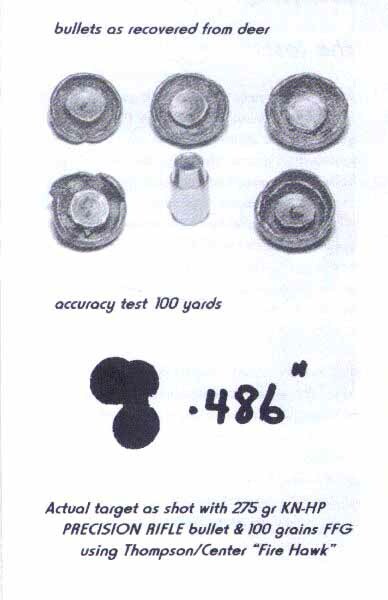 It should be noted that five and only five bullets were used in this test. All five bullets were recovered exactly as they appear in the photograph. Two of the bullets were actually lying on the ground after exiting the body cavity while the other three were recovered within the first inch of the bullet recovery medium. This test proves conclusively that the bullet performed exactly as designed. The front half of the bullet gives immediate expansion while the balance of the bullet gives total penetration. Precision Rifle Custom Muzzleloader bullets are designed for immediate expansion and complete penetration for the efficient, instant, humane harvesting of a variety of big game animals.